AbbVie and Johnson & Johnson’s Imbruvica has become the first chemo-free treatment for first-line chronic lymphocytic leukaemia (CLL) to be approved by the FDA, its tenth indication. The green light from the US regulator is for a regimen based on BTK inhibitor Imbruvica (ibrutinib) and Roche’s anti-CD20 drug Gazyva (obinutuzumab) in CLL – the most common form of leukaemia – as well as a related disease called small lymphocytic lymphoma (SLL). The approval is based on the results of the phase III iLLUMINATE study – presented at the American Society of Haematology (ASH) meeting in December – which showed that the duo reduced the risk of disease progression or death by 77% compared to the combination of Gazyva plus the chemotherapy chlorambucil in treatment-naïve patients. It’s very much an add-on indication for Imbruvica, which is already used as a monotherapy in first-line CLL as well as a combination with chemotherapy plus Roche’s older CD20 drug Rituxan (rituximab), and allows J&J and AbbVie to double-down on their already-dominant position in first-line CLL. In addition to the Imbruvica/Gazyva combination, AbbVie and Roche are also running a trial (CAPTIVATE) of AbbVie’s BCL-2 inhibitor Venclexta (venetoclax) with Imbruvica which could provide yet another front-line option for CLL patients. Venclexta was approved as a monotherapy alongside Rituxan in relapsed CLL last year, and recently reported positive first-line results alongside Gazyva in the CLL14 study. Meanwhile, at ASH 2018 they also reported results of a study showing that Imbruvica with Rituxan alone bested the widely-used chemo-based combination of fludarabine, cyclophosphamide and Rituximab in previously untreated patients, cutting the risk of disease progression or death by 65% and the risk of death by 83%. 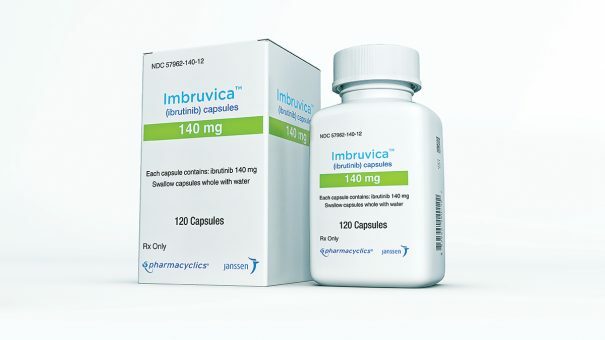 “In just a few years, Imbruvica has become an important treatment for CLL,” said lead iLLUMINATE investigator Carol Moreno of the Autonomous University of Barcelona in Spain. “Imbruvica as a single agent – and now as a combination with obinutuzumab – provides patients with CLL with an alternative to frontline treatment with chemoimmunotherapy,” she added. AbbVie said during its fourth-quarter results call last week that it booked $3.6 billion in Imbruvica sales in 2018, plus another $344 million from Venclexta, and expect the pair to add another $1 billion to that tally over the course of 2019. Both drugs are important for AbbVie as it faces the first signs of weakness with Humira (adalimumab) its blockbuster immunology drug which is the world’s top-selling medicine with sales of almost $20bn last year.